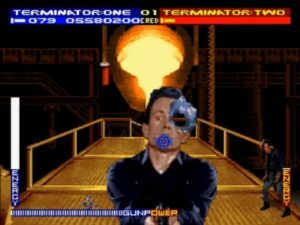 As regular readers of the site know, when the reviews start lagging, it’s time to break out a Terminator game. I’ve been saving this one for just such an occasion. The actual arcade game is one of my absolute favorites. To this day, it remains one of about five games I have for MAME, and I’ll still burn through it at least twice a year. I don’t know what percentage is nostalgia and what percentage is because it features badass steel skeletons stomping around a nuclear wasteland, but oh, the hours of fun this game has given. Shooting ol’ T1k gives a surprisingly faithful recreation of the movie’s legendary CG effects. 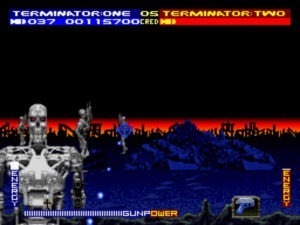 Further, the arcade version was hands-down the baddest game to come out of the second film. Mainly it’s because the graphics and sound were incredible. I think anyone could appreciate grabbing one of the rattling cabinet-mounted machine guns and blasting through its detailed settings, but if you were a fan of the film, you were especially in for a treat. Midway obviously got some time on the T2 set and permission to shoot stills of full-size Endoskeletons, models, miniatures, and the actors’ faces. Seeing a crisp digital still of Robert Patrick pop up from the bottom of the screen was cool. Watching it deform, liquid-metal like, in response to your gunshots was even cooler. 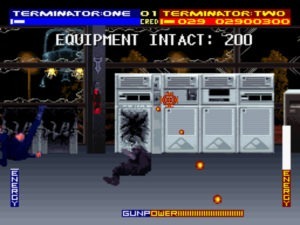 You play as Schwarzenegger’s Terminator (or a pair of them in two-player) and shoot through seven levels based on the film. Over half the game takes place in the future, providing some backstory and covering events referenced, but not seen, in the film. 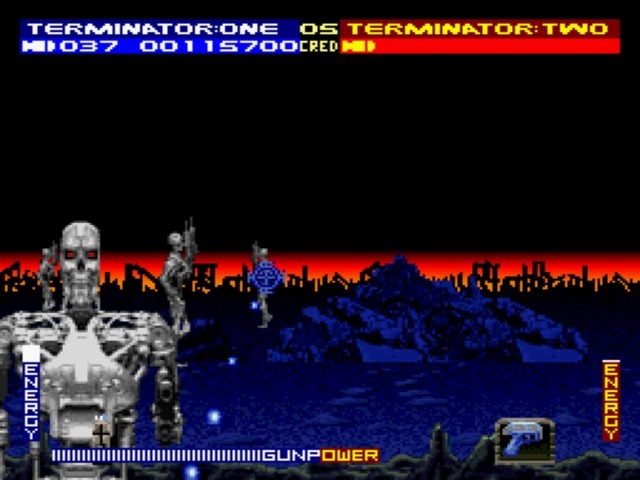 You’ll fight across future battlefields, into SkyNet, and even shoot apart the malevolent supercomputer piece by piece. The last three levels then take place in 1991, as you blast apart Cyberdyne’s office, protect John and Sarah Connor from the T-1000 chasing them with both a helicopter and a tanker truck, and finally douse the T-1000 with enough liquid nitrogen to freeze him and blast him into a pit of molten steel. It hits all the highlights from the film while adding a few of its own, and Terminator 2 fans aren’t likely to be disappointed. The game gives an extended look at the film’s nightmare nuclear future. I owned the Genesis port back then, but that was clearly a mistake – the SNES version far outclasses it. This is the kind of game where the SNES’ expanded color palette mops the floor with the Genesis, and Sega’s console simply can’t compete with what’s on display here. While the SNES can’t claim the same level of detail as the arcade hardware, the result is still damn impressive, and the port surprisingly faithful. Digital images of enemies and actors are retained; lower-res but surprisingly sharp. This is a big one considering that every other port – including the computer versions – had to go with revised, hand-drawn art. All the colors from the dark blues of the future landscape to the shiny glass-and-plastic offices of Cyberdyne match the arcade hardware almost exactly, and really the only thing you’re missing are some extra animations and dressings (like broken fences and greater depth and activity to the backgrounds) and some of the clarity of the higher-res arcade artwork. It’s also missing the guns. While not a deal-breaker, I do miss those plastic, cabinet-mounted guns kicking back as you held down the trigger. Here, your options are the awkward control pad, the massive Super Scope, and the SNES mouse. Of the three, the mouse is the ideal choice. You’ll get the precision and quick response you need from the last two, but the mouse has the benefit of not being shaped like an unwieldy bazooka. It also allows for excellent support when playing the game on an emulator; not that you ever would. Miss even just a single filing cabinet, and you’ll get the bad ending. I can’t just leave it with “you’ll love the game if you liked the film!” so here are a few gripes. First, the gunpower meter. Your main weapon is a standard bullet hose, and as you hold the trigger down, you lose power from a meter marked at the bottom. Bullets soon start puttering out at a miserable rate, you can’t direct enough death to quickly knock down a Terminator anymore, and you’ll inevitably get killed. When you release the trigger, you slowly start to build gunpower back – but releasing the trigger is almost equally suicide as the game ensures that there’s always something on the screen you need to be killing. I think the intent is to put some kind of limit on spray-and-pray gunplay, but that’s basically the game’s biggest strength. The result is that you’ll always be frantically shooting for powerups; one kind that instantly recharges your gunpower, and another kind that instantly recharges it and locks it at full for a brief period. I suppose it’s a better system than having to “reload,” but it still adds a layer of complexity that’s neither interesting nor fun. You’ll note that later games (like Revolution X) drop this idea altogether. Second, the infamous third and sixth levels. 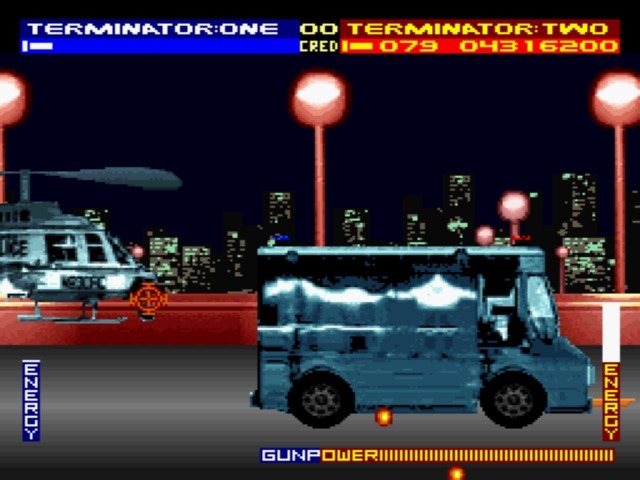 In both you’ll have to defend a vehicle against some kind of threat – endless aerial strafing runs in the third, and a kamikaze T-1000 in the sixth. Both are legendary ball-busters. 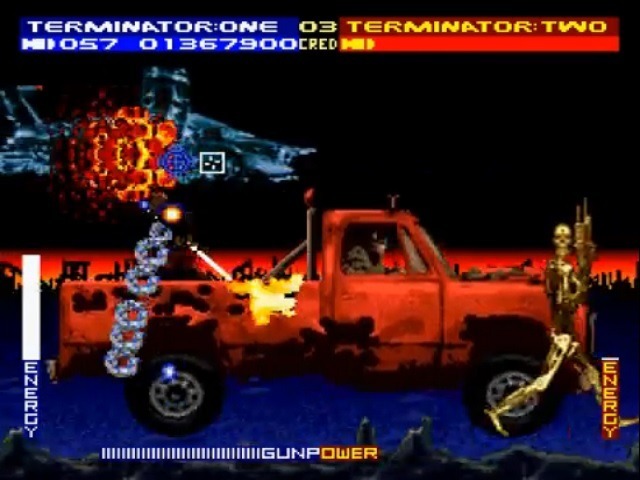 The third level relies on you shooting and driving missiles into the flying Hunter-Killers as soon as they appear, since they cannot shoot Connor’s truck while they’re being shot at themselves. The main problem here is that you quickly run out of precious gunpower, with no pauses for recharging and no pickups to restore it. You can try and throw down a field of flak with missiles, but if you run out of rockets, death will be your only way of getting more. Look, T-1000! Can’t we just talk this out? The fliers randomly come from either the left or right of the screen, highlighting the control issues. Forget it with the control pad; just get (or fake) a second player to cover each side of the screen. The mouse and Super Scope make it a little easier, but you’ll still have tight windows of response to shuttle back and forth if you want to prevent the truck from taking damage. This same problem occurs in an even less-forgiving manner in the sixth level. 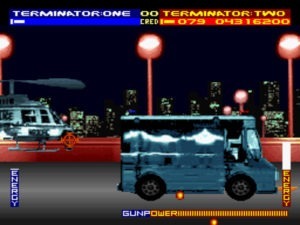 The T-1000’s helicopter can come from multiple points above and behind the SWAT van. He swoops in so fast – especially compared to the hindered speed which you can bring any of your control schemes to bear – that you again have to anticipate more than playing a reactionary game. I found the mouse to help the most, and two players make these sections much easier, but be prepared to burn a lot of virtual credits on these two levels. It’s all the more annoying that the hardest level in the game comes right before your awesome battle with digital Robert Patrick and various animated effects, but thems the breaks. Audio for this version sounds pretty great, especially in comparison to the Genesis version. That one had to create its own music for whatever reason, but on the SNES, the arcade tunes stay. The music is noticeably weaker than the booming arcade tracks, however, and some tracks are dropped while others get reused. A handful of digitized Schwarzenegger lines make it over as well, though he’s noticeably less chatty than in the arcade. Effects make the most complete transition the console, and sound true to the original. Gunfire, whirrs and clomps of Endoskeletons, and especially the explosions, all sell the experience well. All around, this is an amazing home port. I’ve only seen screens of the Amiga version, but I’m going to go out on a limb and say this is the best home version you can find. Obviously, this is a little different than tossing a few casual quarters into an arcade cabinet, so only Terminator fans need to bring this into their humble abodes. But regardless of how you feel about the film, it stays as close to its source arcade as its hardware can allow, and for doing so achieves the most you could ever ask from a port. Loads of fun for Terminator fans. Closest home representation of the arcade graphics. Vehicle levels are tough, need the mouse or Super Scope to get the most out of it. Gunpower limitation can get annoying.